The Great British Bake Off (GBBO) has returned to our screens!! “Hurrah.” The past week’s TV adverts and tweets built the tension, almost taunting us with what’s in store and week 1, cake week, certainly didn’t disappoint. The bakers started by making the classic Madeira Cake, followed by Mary’s technical challenge of Walnut Cake and then onto the showstopper of Black Forest Gateau. Many of the creations looked wonderful, and that was just week 1, what will they pull out of the bag later in the series! 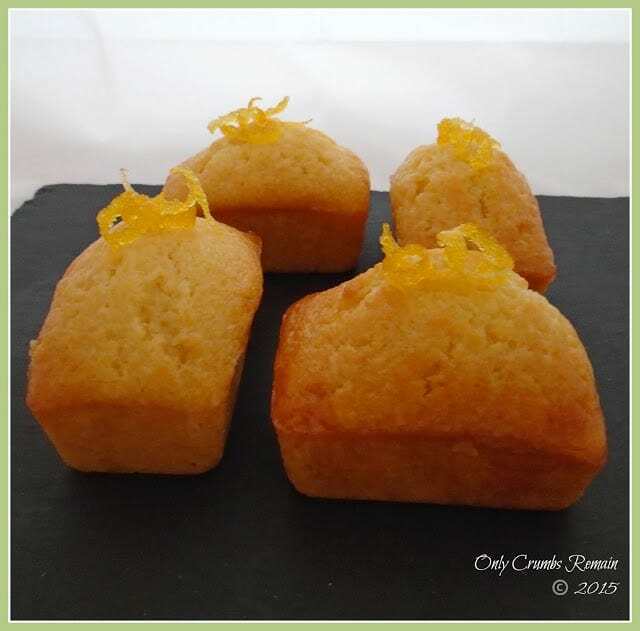 I glazed our cakelets with a lemon infused sugar solution and decorated them with lemon zest; a classic flavour for this cake. The cakes were beautifully moist and carried a wonderful lemon flavour. 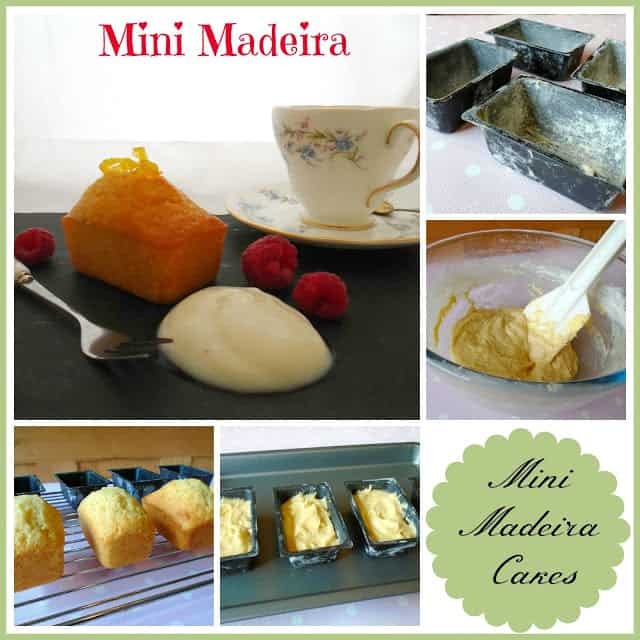 Being a mini Madeira, each cakelet was suitable as an individual serving. Mr E & I served ours with a few fresh raspberries and a little vanilla yogurt, though I can image that a lemon yoghurt would be equally lovely. The yoghurt was a healthier accompaniment than using a heavy cream. 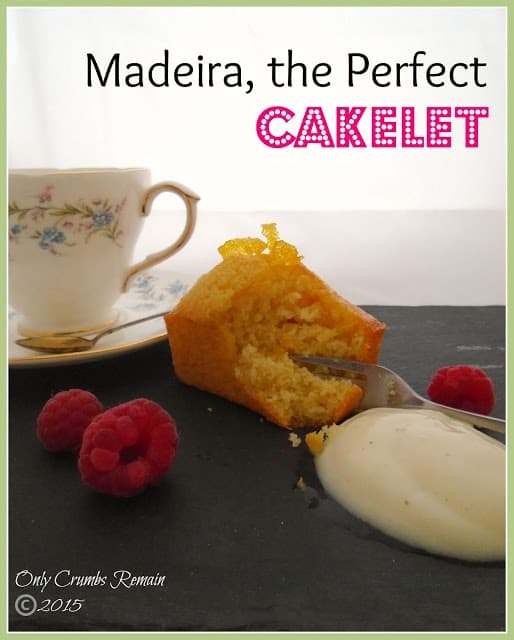 So the Madeira Cake; an understated, straight forward, no nonsense sort of cake. As Mary explained, the classic Madeira cake has a close crumb structure, with a slight dome and crack to the top of the cake. From reading James Morton’s book, ‘How Baking Works’ (a previous GBBO contestant), it would seem that the Madeira gets that classic dome and crack from the increased volume of dry ingredients in the ratio of wet to dry. As you no doubt notice, there is much more flour in this cake than the traditional Victoria, for instance. Another easy sponge, made as a nod to the classic Apple Crumble & Custard taking the form of a cupcake. Time: hands on time 20 minutes; plus 20 – 23 minutes bake time. 1. Pre-heat the oven to 190c / Fan 170 / Gas 5. Place the baking tray (large enough to hold all of the mini loaf tins) in the oven to warm. 2. Prepare the loaf tins. Grease each loaf tin with butter, ensuring the sides and corners are fully greased. Add half tsp of flour to each loaf tin. Holding a loaf tin over the sink, jiggle it to distribute the flour all over the inside of tin, ensure that all of the butter is coated. Tip out any excess flour. Repeat with the remaining 5 loaf tins. 3. Make the sponge. Place the fats, sugars and lemon zest into a bowl and using either a wooden spoon, electric hand held beater or stand mixer, beat the ingredients until they are pale, soft and fluffy. Add the beaten eggs a little at a time, beating well between each addition. If you feel the mixture is starting to split mix in a spoonful of the weighed flour. Sieve the flour and salt into the bowl, and using either a large metal spoon or spatula, fold the flour into the mixture carefully aiming not to overwork the mixture. 4. Fill the prepared cases. Using a teaspoon, fill your mini loaf tins with the mixture. You’re aiming for the tins to be half to three quarter full. Use the back of the teaspoon to level the mixture, avoiding getting it up the sides of the tin. 5. Bake. Place the loaf tins on the warmed baking tray in the centre of the oven and bake for about 20 – 23 minutes. You may need to rotate the tray after 16 minutes. You’re aiming for the cakes to be golden, well risen and with a crack in the top. Insert a skewer, or similar, in the middle of the cakelets and if it comes out clean remove from the oven. Bake the cakelets a minute or two longer if the skewer comes out with a little uncooked cake mixture. 6. Cool the cakes. Remove the cakes from the oven and place on a cooling rack. Insert a pallet knife between the loaf tin and cake to ensure it hasn’t stuck. Remove the cakes from the loaf tins after 5 minutes and continue cooling the cakes. 7. Meanwhile prepare the glaze and lemon peel decoration. Place the water and sugar into a small pan and set it over a medium heat to dissolve the sugar. Using a lemon zester or sharp knife, create long thin strips of lemon zest. Add the prepared zest and juice to the pan and simmer for 5 – 10 minutes. Remove the lemon zest from the pan and place on a tray lined with a sheet of greaseproof paper, ensuring the zest isn’t touching each other. Once the cakes have been removed from the oven, turn the oven off and after 5 minutes place the lemon zest into the oven to dry out as the oven cools. Allow the lemon syrup to cook down until it reduces by a half, then remove from the heat. 9. Glaze the cakes. Once the syrup has cooled a little, use a silicone pastry brush (or similar) to carefully paint the tops of each cake with the syrup. Remember the syrup will still be hot. Sit the cakes on a cooling tray again with a sheet of absorbent paper beneath to catch any excess drips. Set aside to dry and decorate with a little of the lemon zest. Enjoy with your favourite pot of tea! Another amazing bite – you got mad baking skills lady! 😀 Thanks for sharing with us at #TryaBiteTuesday!!! 😉 you're too kind Debra! There are so many other bakers out there who are a waaay better than I am! These are so adorable and look perfectly baked! Thanks for entering into Treat Petite. Your welcome, thanks for hosting though! These look great, I love the fact they are mini and want a mini cake tin now! Were they yummy? Thank you 🙂 They were REALLY yummy; soft, light, and full of flavour from the lemon. I normally like a little buttercream / frosting with my cakes, but I really didn't miss that here – I think because they were a nice dinky size. 🙂 those tins are great – they obviously cooked so much quicker being individual but also it meant I could reduce the amount of batter I made so we ended up with just a small handful of cakes rather than one large cake. You're so right Alison – it's just the perfect size to squeeze in alongside the sandwich and banana. what cute mini cakes – I love seeing them look so pretty, cute and lovely! Aw thank you Rebecca. It really made a nice change having a petite cake per person. These are so incredibly cute and love the term 'cakelet' – I think you may have started a new trend there! Thank you Cat. It's a great word isn't it, so appropriate. I'd love to say it was a word I dreamt up but it wasn't; as I mentioned in the post I first read it in one of Betty Stamps posts. They were so yummy Jenny, the lemon flavoured syrup really brought them to life. Thank you Cathy. These were just the perfect size and it meant I could make as many (or as few) as I wanted; after all sometimes you don't want a huge cake which takes ages to eat. 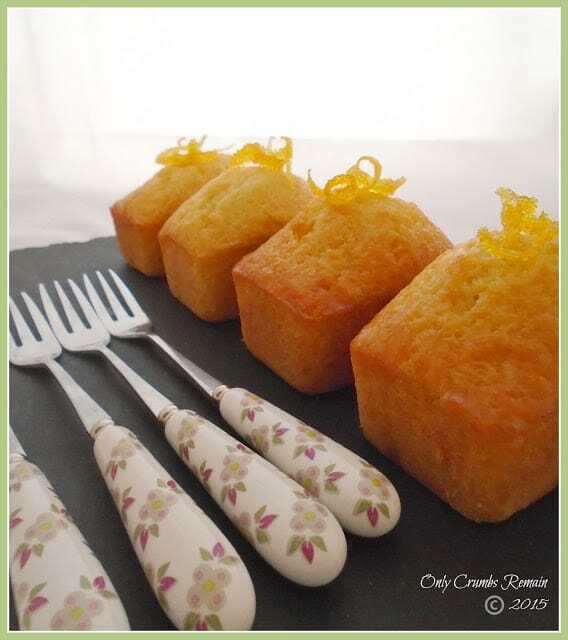 Mmm, they look lovely, and the lemon drizzle topping sounds really good. Aw thank you Lucy. I was really pleased with how much lemon flavour came through in the eating. I think the zest must have imparted quite a lot of flavour into the syrup for those few minutes whilst the strips cooked.